supplier continue to pursue its ambitious goal of offering its customers solutions that are sustainable in every respect – and everything from a single source. The new Beumer fillpac filling machines, with their seminal weighing electronics, will be our feature presentation at PetroCem. The Beumer Group supplies innovative solutions from a single source. The specialist’s program includes belt apron conveyors that, for example, guarantee fast and economic conveying of cement clinker. These conveyors are based on field-proven belts as used in our bucket elevators. Another major topic at the trade fair booth will be the high-capacity belt bucket elevators type HD, which transport coarse, highly abrasive bulk goods with grain sizes up to 120 millimetres. In order to load bulk materials quickly and without dust,Beumer offers bulk loading heads. These are designed according to the double-wall system: The material inlet and the dedusting unit are separated from each other. In order to balance out any minor positional deviations of the vehicle, the bulk loading head can be moved laterally during placement. Stationary bulk loading heads are often no longer sufficient for large loading capacities as, for example, in the cement industry. It should be possible to move the bulk loading head to each filler neck of the vehicle. For this purpose, Beumer has developed mobile loaders that adapt to the length of the vehicles. If open vehicles are to be loaded without dust, various telescoping loading systems are available. To be able to load bagged bulk materials onto trucks in a fully-automated, and above all economical process, Beumer offers its customers the BEUMER autopac loading and palletising system. The machine simultaneously loads and palletises bagged goods directly on trucks without using pallets. Loading bags with this system is particularly efficient because significant manpower would otherwise be required. This is particularly true in emerging market nations, where the transshipment of bagged bulk goods is increasing and labour costs are climbing. For loading rail cars and vessels, Beumer offers telescoping bag loading machines in mobile or swivelling designs. The new, innovative Beumer fillpac sees the system supplier continue to pursue its ambitious goal of offering its customers solutions that are sustainable in every respect. The system can be flexibly integrated with existing packaging lines and is equipped with a weighing unit admitted for calibration. The weighing electronics ensure that the BEUMER fillpac always achieves precise degrees of filling and special software supports permanent communication between the balance and the filling spout. Users can thus optimise their packaging lines because there is no longer any need to remove bags with an incorrect weight from the process. To be able to stack the filled bags on pallets of different sizes in a flexible, precise, stable and even more efficient way, Beumer has completely revised the Beumer paletpac high capacity layer palletiser. The user now benefits from improved accessibility, shorter assembly period, higher flexibility and, as a result, from lower costs. 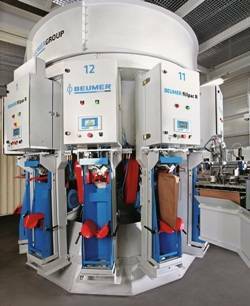 Depending on the product requirements, the Beumer paletpac can be equipped with the newly-developed twin-belt turning device allowing bags to be turned more conservatively and using less force. This removes the need for tooling times in case of product changes, so the maintenance costs are lower and the stacking pattern is even more precise. These are only a few of the benefits compared with legacy turning devices. The experts in Customer Support can easily retrofit this solution on existing palletisers. The geometric precision and the stability of the palletised stacks allow for easy storage and ensure reliable integration in downstream packaging systems. On top of this, Beumer has developed and designed from scratch a new machine from the Beumer stretch hood model range. Our specialists analysed various components and optimised them in terms of function, arrangement and ergonomics. This includes an improved menu system on the machine control, an optimised, ergonomically designed workplace for the operator and material-friendly transporting of the film in the machine thanks to an innovative film transport system. At the same time, the intralogistics specialist guarantees higher system output and improved machine availability for the operator, who also benefits from the lower system height and the far smaller footprint. The intralogistics specialist has equipped all Beumer palletising and packaging systems with the Beumer Group Human Machine Interface (HMI), a newly-developed operator panel with an optimised user interface and optimised navigation. This easily understandable and intuitive interaction concept helps to define efficient working sequences and because the operator can control the machine safely, independently of prior skills, training and capabilities, this also saves time and money. The Beumer Group is also presenting its Customer Support. Customer Support ensures high availability for all of a user’s systems. Their competent experts are deployed globally, taking care of proper maintenance and repairs, delivering spare parts and conducting customer training.